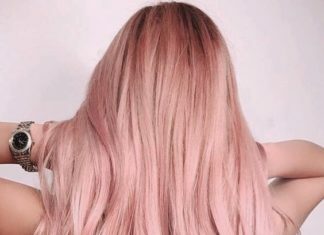 Unnatural hair colors have become the new normal, but sometimes a super bright or pastel color isn’t what you’re looking for. 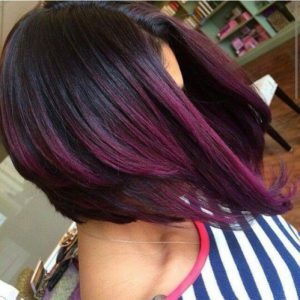 If you’re after a bold shade that’s dark and sultry but can also look regal and sophisticated, dark purple hair is the trendy color for you. 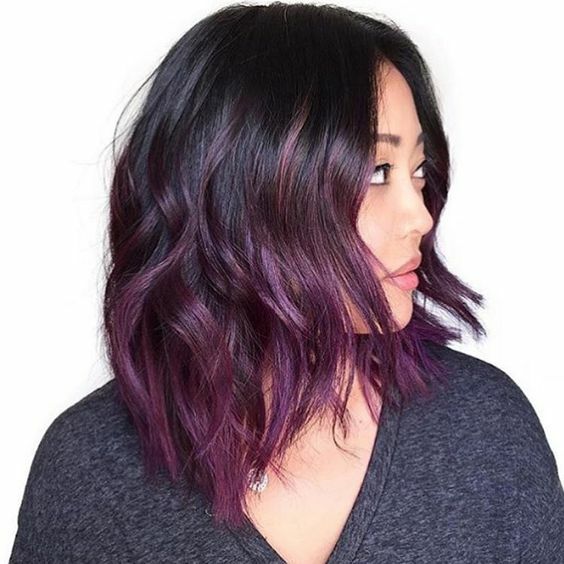 This ultra versatile hue can suit both warm and cool skin tones, depending on whether your lean for a pinkish purple like magenta or a cool violet that’s full of blue undertones. If your hair is naturally medium or dark brown, deep purple is ideal for your first foray into unnatural hair color. 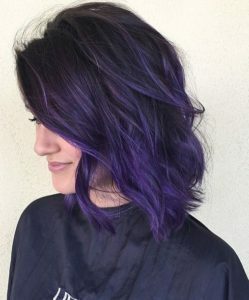 And if you’ve been playing with light pastels and crazy rainbow shades for a while, a dark purple dye job might be the mature new style you’ve been looking for. Our favorite dark purple hair color ideas have something for everyone, from subtle and sophisticated to bold and provocative. This purple hairstyle is dark and sumptuous enough that you can wear it much the same way you would dark brown or black hair. 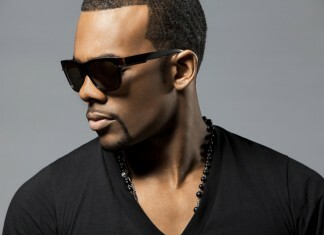 Women with warm skin tones that are medium or dark will find this hair gives their skin a rich glow. 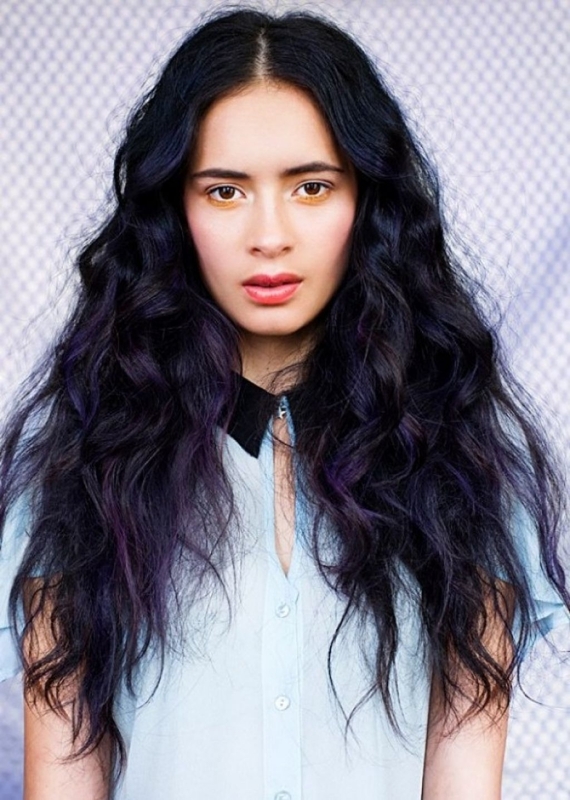 Mix dark purple with a vibrant magenta shade around the face to create a maximum impact hair color. 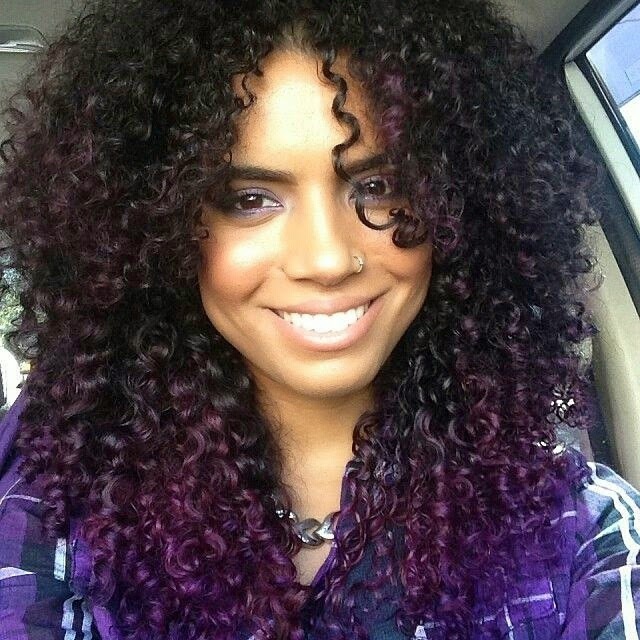 Use dark purple ombre to put a touch of color on your natural curls. This purple is dark enough to be nice and subtle against a natural black base color, but the warm notes still have big impact when it comes to bringing out the warmth in tan skin with golden undertones. Go dark and dusty with a deep shade of mauve that’s slightly lighter towards the ends of the hair’s lengths. This dark but warm hair color is perfect for anyone who can’t decide between a pink and purple style. 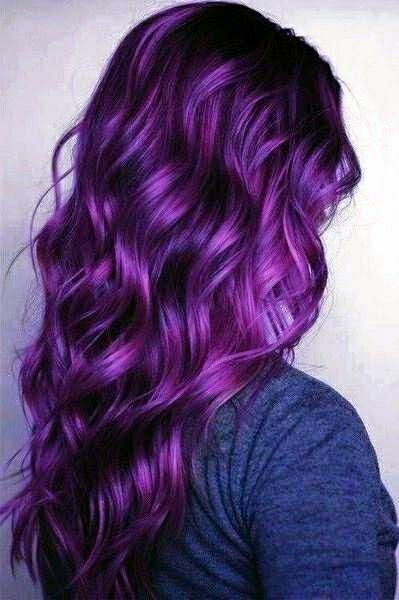 With lighter colors concentrated in hair’s outermost layer, this is a great dark purple style for making your hair appear thicker. For extra warmth and interest, subtle ribbons of copper color have been placed throughout the face framing pieces. 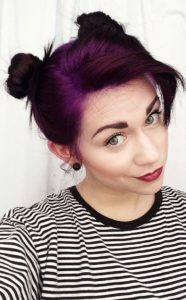 A smoky style is one of the most sophisticated ways to wear purple hair. 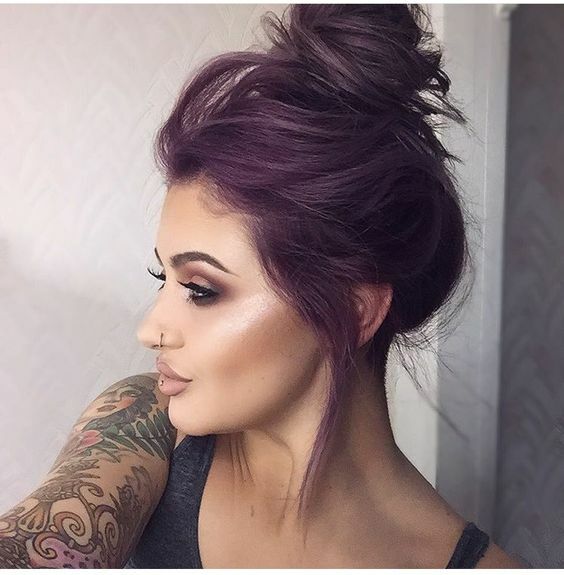 These ashy tones look best against cool complexions, and are blended against dark roots using a flawless color melt technique. 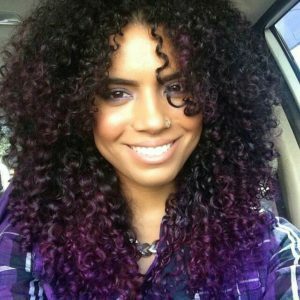 If you want a purple compliment to your natural black hair, try an ombre style that begins about half way down your strands. 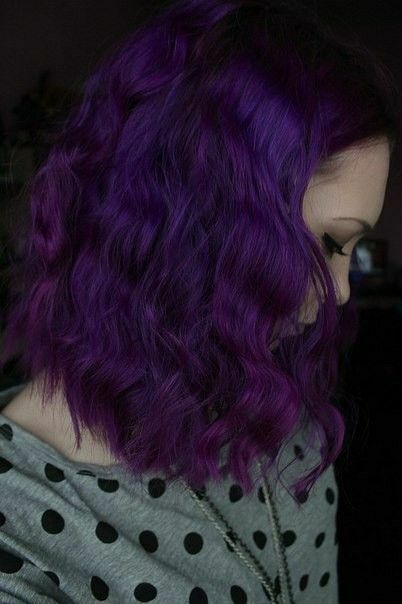 On long bobs and mid length haircuts, this purple can help compliment your warm skin tone. 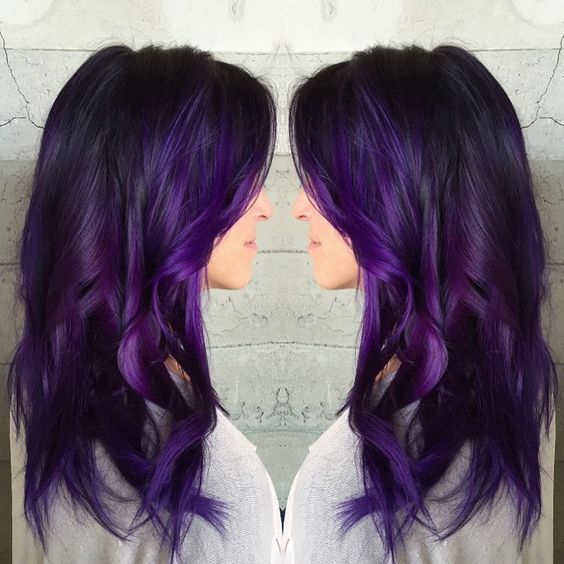 Purple on purple can be a bold color combination, but this style keeps it simple by using a very dark base color that’s almost black, while balayage highlights are only a few shades lighter. 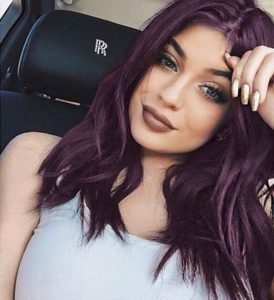 Katy Perry’s shiny purplish black hair is pure gothic glamour, and looks undeniably striking against her pale skin and bright blue eyes. 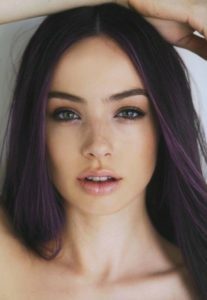 Very dark hair colors have the potential to wash out very light complexions, but can work if you’re going for an intentionally bold look. Dark brows and key makeup choices help to make this aesthetic look carefully curated. 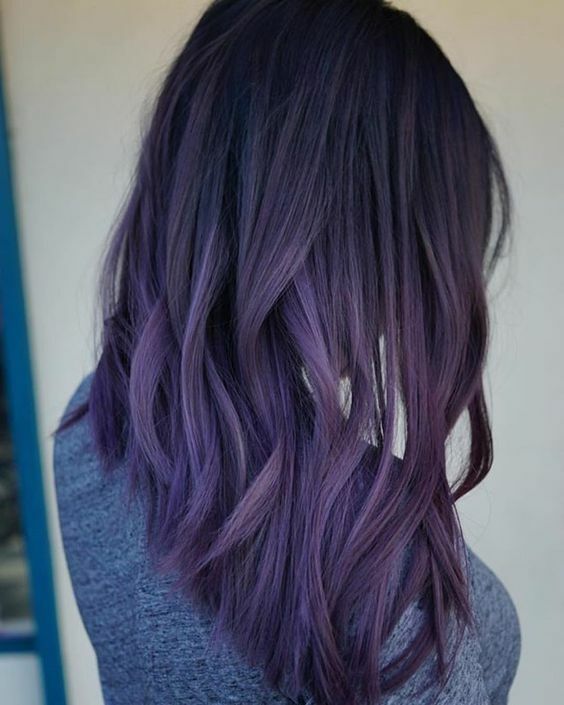 The sheen on this purple color style helps it be a standout style that won’t be mistaken for brown or black even in low light. 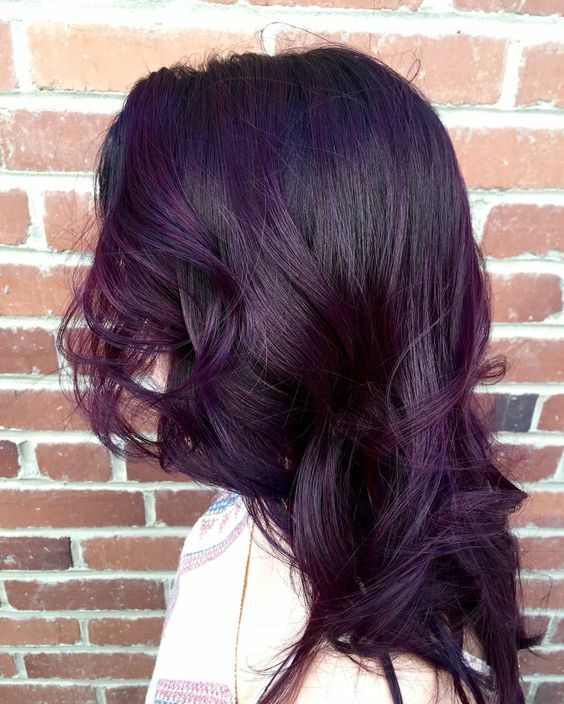 We love wine and grape shades of purple for playing up golden tones in skin. 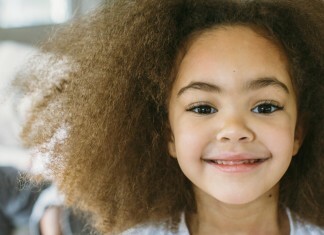 This dusty version lends a nice antique look to your style, and lets you take a dip into pastel territory without wearing a color that’s too light for your medium or dark skin tone. 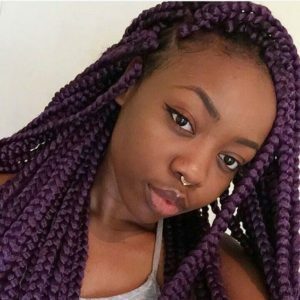 Try box braids if you’re looking for a protective style that allows you to experiment with dark purple hair color. 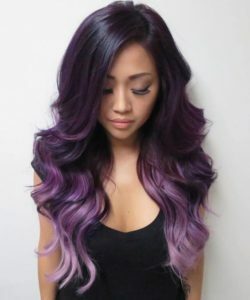 Pink highlights in the middle of these strands help to give dark purple hair some extra contouring power. 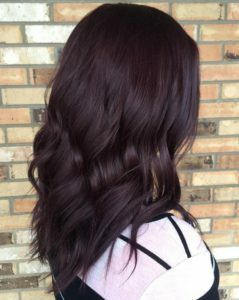 Natural dark brown base colors are an excellent pairing with very dark purple. The two shades blend together to create a subtle hint of vibrancy that isn’t over the top. 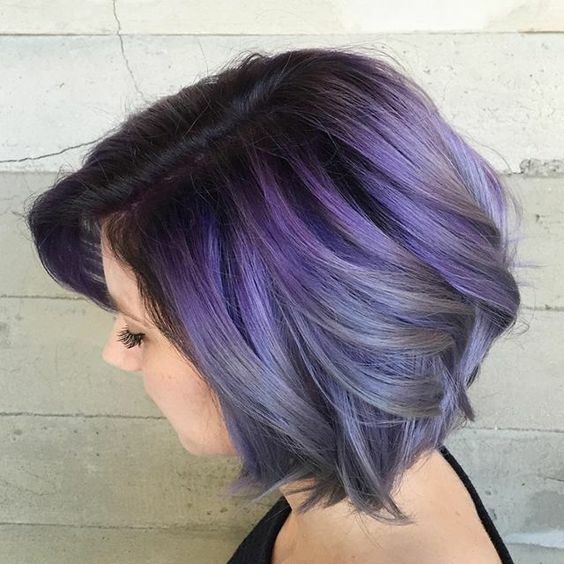 A favorite technique for getting an ombre gradient with seamless transitions, this violet color melt hairstyle is a luxe way to try out an unnatural hair color. A classic dark purple color for feeling sultry and sophisticated, deep plum pulls red notes that look nice with both medium and dark complexions. 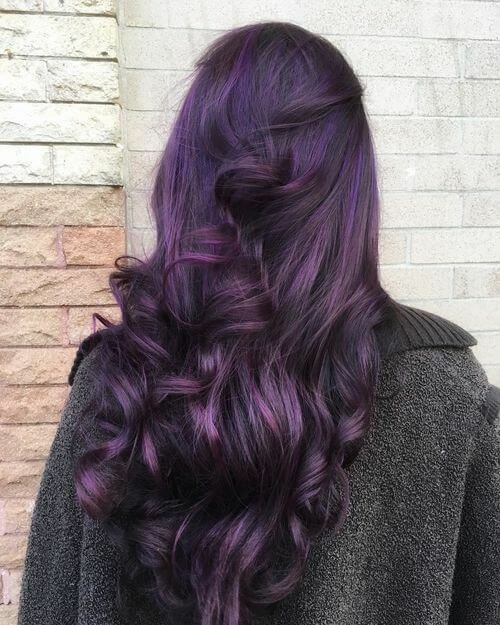 Espresso brown hair with a dark purple tinge and brighter highlights makes an excellent style for anyone who’s on the fence about an ultra-bright shade of purple. 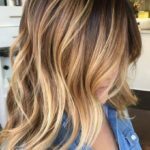 This subtle balayage color is in the perfect dark purple to play off of warm complexions or olive skin with lots of yellow undertones. 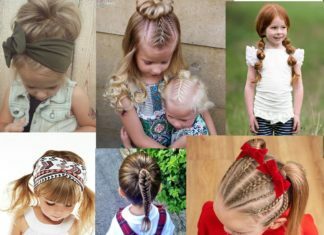 Are you a nontraditional bride looking for an unnatural hairstyle that’s special enough for your wedding? 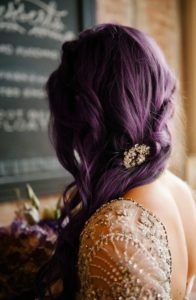 This grown up shade of dark purple will put a unique twist on your wedding day style, and is a romantic compliment to a champagne or ivory colored gown. 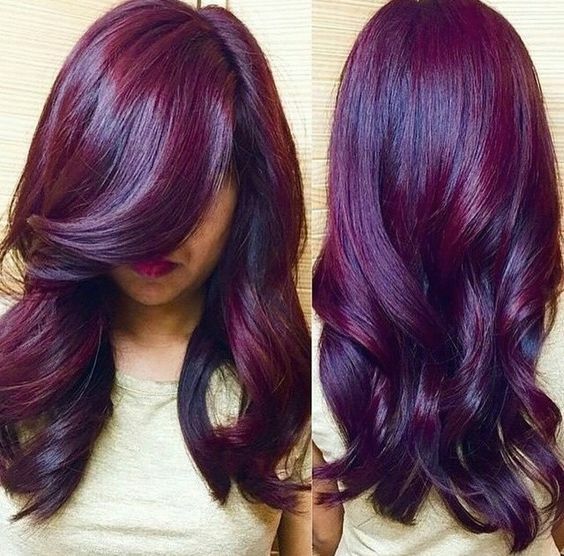 Reddish purple hair colors like this dark mahogany style are perfect for women with medium and dark complexions with cooler undertones. 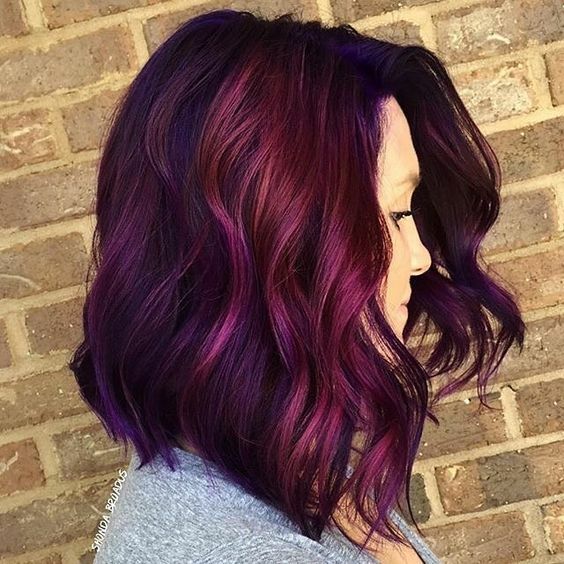 If you love all shades of purple from the darkest eggplant to the lightest lavender, this purple color melt style takes your hair on a technicolor tour from roots to tips. This dramatic style is for women who don’t mess around with single tone hair color or simple natural shades. 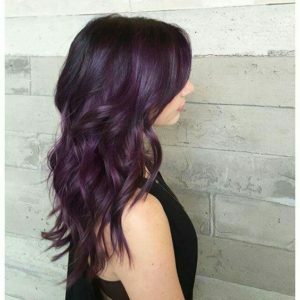 Dark purple doesn’t have to represent a dramatic change, and can be a subtle freshen up for hair that’s naturally medium or dark brown. 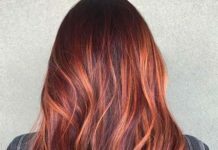 If you’ve been thinking of going dark for the fall or winter, this is an easy way to do it. 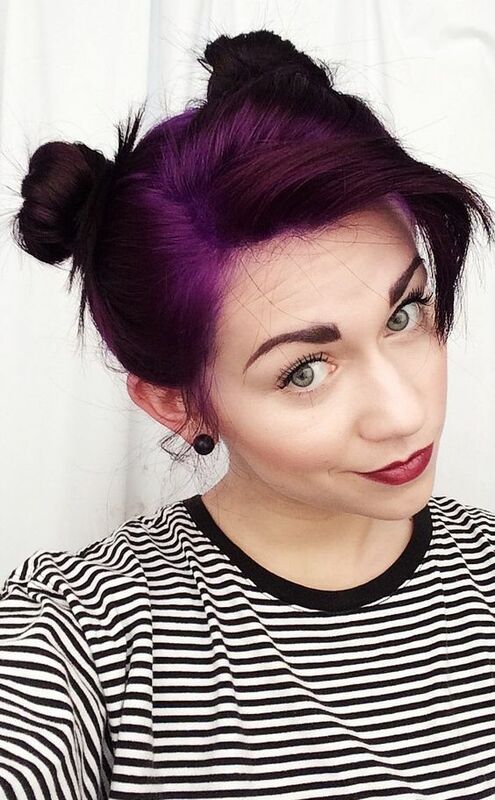 Electric violet lets you wear your purple hair in a dark style that’s vibrant enough to turn heads wherever you go. 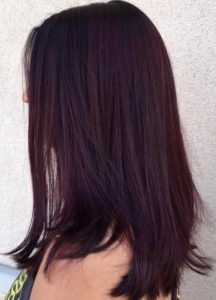 This dark shade of raspberry jam is a good choice for natural brunettes who want a purple hair color that doesn’t stray too far from their natural color. Dark shades of purple and brown create a pretty color palette that hits just the right spot between natural and bold. This simple purple ombre style is easy enough to do at home, making it a great choice for your first foray into at-home dip dyes. Katy Perry has proven herself to be a queen of out-there hair colors, wearing everything from seaweed green to platinum blonde. 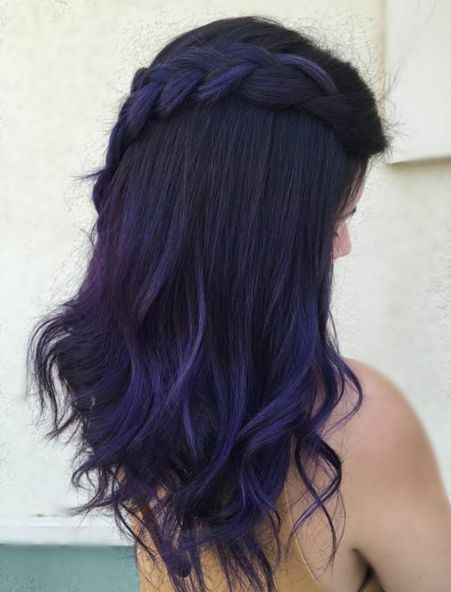 Dark shades make for extra striking styles on the singer’s pale complexion, and this dark purple look is close enough to black to function as a neutral hair color. Dark rich plum is an excellent shade for women with olive complexions or warm skin with yellow undertones. 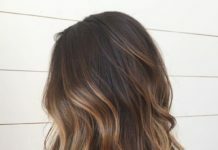 Try this look if you’re a natural brunette who’s after something new for fall or winter. Breaking the usual convention of darker natural roots and lighter shades towards the ends, this dark plum style features vibrant violet roots for a maximum impact. 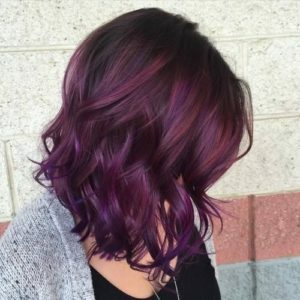 If you’re ready to graduate from single tone hair color, go for a dimensional violet that’s got enough different tones to shine and sparkle in any light. 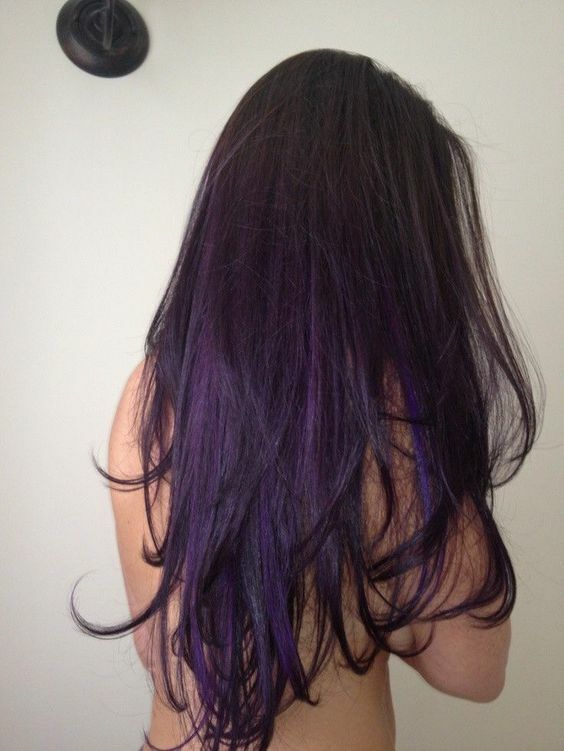 Dark eggplant and vibrant violet highlights make a great pairing for a doubly delicious dark purple hair color style. 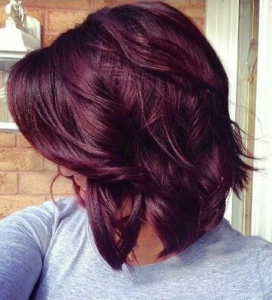 A vibrant shade of dark magenta can take your sleek and sophisticated bob into the next level of style. One of the most subtle dark purple hairstyles on our list, long hair that’s naturally black gets a sneaky lift from a very dark shade of eggplant applied to the ends. 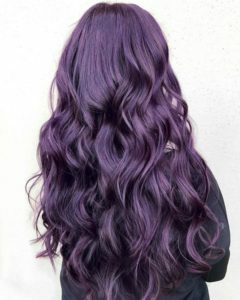 If you’re not sure what shade of purple will go with your skin tone, this ultra dark purple is a good option that will blend well with most complexions. 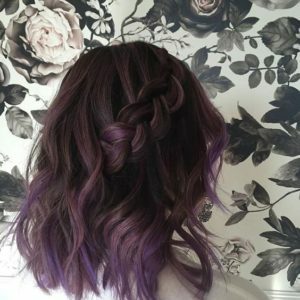 This gorgeous mulberry wine hairstyle is soft and luxurious with an intensely saturated color. Wear with a deep dramatic side part and thick curls and you’ll be ready to debut your dark purple hair at the fanciest of events. Want to feature dark purple in your hairstyle without making it the only color on your head? Peekaboo purple offers just the right amount of vibrancy, and is surprisingly easy to do at home. 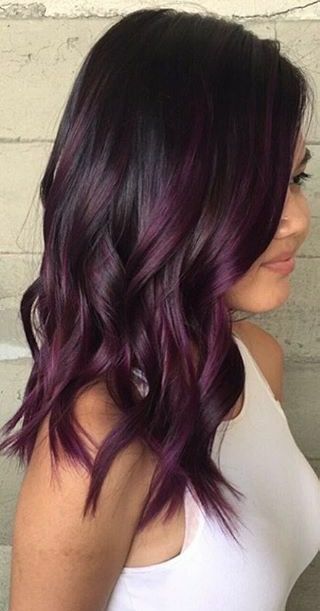 Coloring a few strands on the inside of your hair leaves more room for error if you’re lightening your own hair before applying dark purple dye. Dusty dark purple makes a great all-over color, especially in this gorgeous multidimensional palette.